Designed by Foz Design in collaboration with The Mufson Partnership, a NELSON Company and architect of record, The BLOC is an internationally acclaimed healthwellness creative engagement agency that found a new home in Manhattan’s Financial District on the edge of the East River. The new office brings together over 200 employees previously split between two locations. The space’s open concept has a casual, creative feel that reflects the agency’s own brand. With a variety of meeting spaces and work areas, as well as standout views for all to enjoy, the design fosters efficiency and inspiration. The historically industrial, mercantile and marine context of what is now the Financial District inspired the overall aesthetic of the space, including materials, finishes, and product selections. It also influenced the design of custom components, including the custom bench system at the office perimeter, as well as workstations with solid wood desktops and raw steel components. Among the priorities of the design: inspiring creativity, fostering collaboration between the accounts-oriented and creative teams with ample room for a variety of meeting spaces, and leaving the views of the river and beyond unobstructed for all to experience. These goals were achieved by creating three distinct sections within the open office areas, which were further distinguished by being set at various elevations: raised platforms with offices and conference rooms, workstation areas, and perimeter meeting spaces. Utilizing 55,268 sq. ft., The BLOC’s brand and office design both reflect creativity, innovation, being cutting edge, having a global perspective, and an informal/casual/comfortable feel. 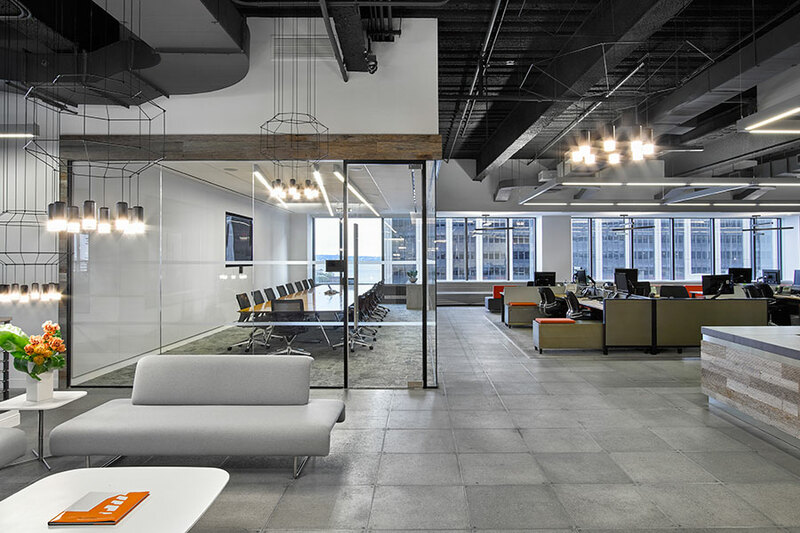 Shades of gray and orange exude an edgy, decidedly “un-corporate” feel. Along the perimeter, flexible furniture from Teknion allows for multiple seating configurations, and accommodates the varied size, type, and nature of meetings at The Bloc.